Passed in 1982, the Canadian Charter of Rights and Freedoms guarantees certain fundamental rights and freedoms to every citizen. A passionate advocate for justice and the protection of the accused, David G. Bayliss is deeply familiar with the Charter. He thoroughly examines the actions of the police and other parties as he works to build effective defences for his clients, from the initial investigation to arrest, detention and the court process. David has obtained substantial civil awards for people whose constitutional rights have been violated by overzealous police and prosecutors. Hiring a Toronto lawyer who understands how the Charter works and how it can impact the outcome of a trial is extremely important when facing a serious criminal charge. Upholding the Charter should be at the forefront of any criminal lawyer’s representation. However, this is a complicated and continuously developing area. David G. Bayliss is a Toronto criminal defence lawyer with a proven record of results in Charter litigation. Section 8 of the Charter protects Canadians from unreasonable search and seizure. If evidence is obtained in a manner that infringes upon an individual’s Charter rights, the evidence may not be permissible to the courts. Even in cases where the facts are not in the defendant’s favour, if a violation of the Charter occurred while police or other officials were gathering evidence, investigating or prosecuting, the defendant can have evidence excluded. David G. Bayliss is a Toronto lawyer with substantial experience and success in the area of Charter of Rights litigation. 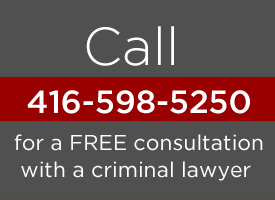 For a free consultation, contact the criminal law firm of David G. Bayliss online or call 416.598.5250.